The Trap is set in the wilds of British Columbia in the late 19th century. A French-Canadian fur trapper, Jean La Bete (Oliver Reed), arrives at a trading post with his latest wares, just as a wife auction is finishing. Yes that's right, a wife auction. (They do still have those in Canada, right?) A group of women have arrived, petty criminals and prostitutes, who have been freed from jail by horny lonely frontiersmen, on condition that they marry their benefactors. One woman's prospective husband has died and so she is auctioned off to the highest bidder. Jean tries to bid but is too late. Later, after a night of drinking, he arrives at the home of the owner of the trading post (Rex Sevenoaks), demanding the money he owes him. The trader is in financial trouble, heavily in debt, and Jean's appearance makes things worse. He had been told that Jean was dead, but now he has to find money to pay this debt too. But his scheming wife (Barbara Chilcott) has another idea. If Jean wants a wife then he can have her servant girl, Eve (Rita Tushingham), a bargain at only a thousand dollars. Eve was rescued by the trader as a child, after her family were burned alive by Indians, and brought back to the trading post. Eve hasn't spoken a word since, but she is young and a virgin, and not a petty criminal like the other women being brought to the post. So Jean agrees, accepts the girl in lieu of the money he is owed, and drags the reluctant Eve off to his cabin in the mountains. Jean expects Eve to help him hunt, warm his bed and bear him children, but she's understandably not that enthusiastic, especially as he mostly barks at her and calls her “woman”. In the mountains, the two face the dangers of the wild, including wolves and wild cats, and gradually Eve attempts to domesticate Jean and his shack beside the river. When Jean is injured in an attack by a wolf pack, he becomes dependent on Eve for survival. She now has to show a lot more grit, trudging miles across the snow to get help from an Indian village, and finally bringing herself to kill a deer for them to eat. Although she warms to him when he is injured, there is also the possibility of escape. Will she stay and become the wife he wants, or return to the trading post and civilization? 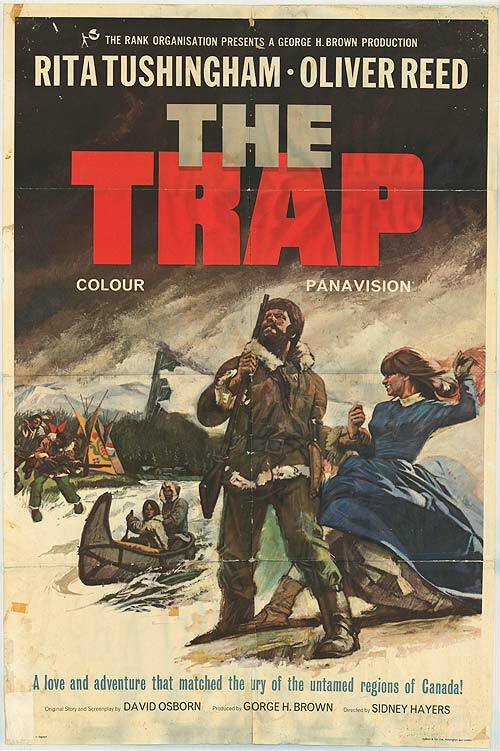 The Trap is a generally well-mounted production, filmed, as the titles proclaim in “the mountains and forests of British Columbia”. Sidney Hayers is usually considered to be a journeyman director and his work here is competent rather than inspired, but he has a good team to support him. The Canadian locations are, as you would expect, magnificent. Hayers has the cinematographer of The Third Man and Brief Encounter, Robert Krasker in his final feature film, to photograph them, but you only really need to point a camera at the mountains of British Columbia to get some beautiful footage. The location filming is mixed in with studio work (at Hollyburn Studios in Vancouver and Pinewood in England). The back projection scenes are OK although a little obvious, but the studio interiors playing exterior locations are quite good, save for some very unconvincing-looking fake snow. The animal footage is a mixed bag, with some of it convincing and some less so. Quite a lot of it looks like stock nature documentary footage spliced in, and to my eyes some of the ravenous wolf pack look a bit too much like domestic Alsatians. The reason why The Trap mostly works, though, is because of its excellent casting. While the story may be a little hokey and melodramatic, it has actors whose performances can sell it. Its two stars arrived from very different strains in the British cinema of the 1960s. Rita Tushingham came to fame in Taste of Honey (1961) and is one of the female faces of the “kitchen sink” films of the British New Wave. Oliver Reed was from the less reputable Hammer horror school, having starred in The Curse of the Werewolf (1961) and The Damned (1963). 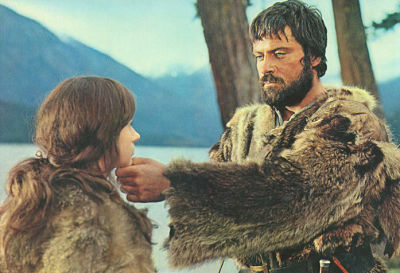 Jean La Bete is a massive, tough, bearlike man, so who better to play him in a film from the 1960s than Oliver Reed? Reed gives one of his best performances as La Bete, with a ripe French-Canadian accent and expansive gestures, but he also finds sympathy and frailty beneath his character's rough exterior. Even better is Rita Tushingham, who is wonderfully expressive as the mute girl Eve. With her huge eyes and quivering mouth she would have made a fantastic silent film star. Eve is almost like a frightened animal in the early part of the film when she is unceremoniously dragged off to Jean's cabin, and the allusive title presumably refers to the trap she finds herself in, like one of Jean's ensnared beasts. The Trap is essentially a simple story, bordering on an allegory, and people fulfil roles as much as portray characters. Take a look at the character names: Eve, La Bete (“The Beast”), The Trader, The Preacher, The Clerk, The Captain. Almost no one except the two main characters is given an actual name. There's even a character called “No Name”, and a bad guy called “Yellow Dog”, which I think we can take to be a character description as much as a moniker. And it's appropriate that the main character is called Eve, since underlying The Trap is the theme of civilization versus the wilderness. Despite the harsh conditions and hazards the characters face, there's certainly something idyllic and Edenic about the wild setting of their log cabin. Eve, however, no longer fits in the wild or in the more civilised world of the trading post, as is implied by her inability to express herself in either environment. But Jean clearly does belong in the wild. He is raw and untamed and lives his life based almost on animal instinct. One stand out element of The Trap is the music score by Ron Goodwin. His main title theme is magnificent. In fact, my favourite scene is the opening one, as Oliver Reed barrels his canoe down the treacherous river to the strains of Goodwin's epic theme music. The music is turned into a little ditty sung by Reed in the film, although it doesn't sound as if anyone spent too much time working on the lyrics. The Trap has slipped into undeserved obscurity a bit now, so much so that the BBC have been able to re-use the music as the theme for their London Marathon coverage for years without too many people recognising it, meaning that the theme music is probably more famous now than the film. Unfortunately, it's hard to find a decent copy of The Trap on DVD or Blu Ray. The film was originally shot in Panavision, as befits some of its spectacular location footage, but most DVD releases seem to be 4:3 pan-and-scan versions. Hopefully someone will make the effort to release this film in high definition in the right aspect ratio, because I think it deserves it. This review was for the O Canada blogathon, hosted by Ruth of Silver Screenings and Kristina at Speakeasy. I've not heard of this film, but it sounds like it has a few strong elements, e.g. the casting and (of course) the British Columbia scenery. Oliver Reed is an actor you don't hear much about these days, so I was glad you featured him in your review. I need to start watching more of his films, and I might just start with this one. I think Reed has rarely been better cast than here, and The Trap is definitely a good place to start if you're interested in exploring his filmography. I checked YouTube to hear the Goodwin music and it truly is magnificent. Combined with your insightful review, I look forward to catching this movie sometime. Ron Goodwin has to be one of the most underrated film composers, he did so much good work in the 1960s. The film is definitely worth catching, even if the DVD releases are less than ideal. Haven't seen this but I am there for anything Oliver Reed, and reading you rave about his performance means I'll be on the lookout for it. In these movies you need stars with his kind of big presence to compete with that gorgeous scenery :) Thanks for being part of the blogathon! Yes, both stars give quite "big" performances. It's a story of grand characters, grand passions and grand emotions set against even grander scenery. This sounds like a typical Oliver Reed character, accepting a young virgin girl in lieu of payment for a debt! What a dog. I'm not a fan of Oliver Reed but I love stories like this with characters who grow as the film progresses, so I'll be checking this one out. I read a quote from Oliver Reed today and it does sound as if he had pretty much the same attitudes as Jean La Bete! I hope you're able to track the film down and that you enjoy it. I think there might be a German or Italian widescreen DVD, but there doesn't seem much hope of that in the UK or US, let alone a blu ray. Just too obscure to be worth it I guess.